Don't miss another opportunity to train with Hanshi Platt, 10th Dan Grand Master. Don't miss another opportunity to support your fellow Budoka by coming to watch their grading! Show your Dojo spirit, support your fellow CMAC TCR Budoka. 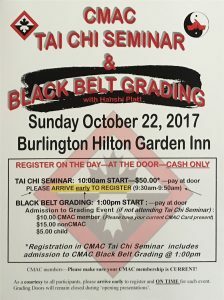 *If you are getting ready for the next CMAC Black Belt Gradings in February & June 2018, here is your opportunity to see what lies ahead for you. Take a notebook & pen/Ipad to take notes. CMAC Merchandise is now available.